Report calls for independent analysis of the risks, alternatives, and cost of a big oil spill in the Mackinac Straits. Enbridge’s 62-year-old Line 5 oil pipeline runs below the Straits of Mackinac, where Lake Michigan and Lake Huron join together. Click image to enlarge. In a surprisingly frank assessment of the threat of a big oil spill in the Great Lakes and the steps required to prevent it, a state task force today called for a series of independent studies of the risks, alternatives, and costs of an oil-related disaster from Line 5, the oil pipeline that crosses the Straits of Mackinac at the top of Lake Michigan. The studies would form the basis of a court fight to close the oil pipeline, a strategy implicitly outlined in the task force report. The authors of the 64-page Michigan Petroleum Pipeline Task Force Report made it clear that they were uncomfortable with the continued operation of the 62-year-old pipeline, which is nearing the end of its design life. The task force report stops short of calling for the pipeline’s immediate closure, citing “inadequate information at this time to fully evaluate the risks.” But in recommending independent studies of the risks, alternatives for the safe transport of oil, and a full accounting of the costs of responding to a big spill, the task force report clearly seeks to make the case and set the foundation for a confrontation with the pipeline’s owner, Canada-based Enbridge Inc., for closing Line 5. The continued concerns over the pipeline’s safety and the cost of a cleanup also led the task force to recommend that no heavy crude oil be transported through the Line 5 pipeline. In 2010, Enbridge’s Line 6B, near Kalamazoo, Michigan, spilled more than 3,000 cubic meters (843,000 gallons) of heavy crude oil from the tar sands region of Alberta, Canada, into a tributary of the Kalamazoo River. The heavy crude was partially responsible for the magnitude of environmental damage caused by the spill, which cost more than $US 1 billion to clean up. At the center of the report’s recommendations is a 1953 state law that holds that Enbridge must “at all times… exercise the due care of a reasonably prudent person for the safety and welfare of all persons and of all public and private property.” This gives the state of Michigan legal authority to hold Enbridge accountable for the pipeline’s potential effects on Michigan’s citizens. The report acknowledged that the state has the legal tools to immediately shut down Line 5 and “abate any immediate and actual threat” from a spill. However, it stopped short of supporting this course of action due to a lack of information, despite the recommendations of environmental leaders. “The magnitude of the harm warrants that the state shut down the pipeline, pending the full review of alternatives,” Liz Kirkwood told Circle of Blue. Kirkwood is an attorney and executive director of FLOW For Love of Water, a Traverse City-based water policy group that has been influential in calling for the closure of Line 5. Enbridge’s failure to release the full details of its safety assessments and account for the presence of zebra mussels that cover the surface of Line 5, in addition to its proposal to continue use of Line 5 “indefinitely,” led the task force to call for an independent analysis of the safety of the pipeline and the projected cost of a spill. Suggested alternatives to Line 5 include the construction of a pipeline that does not cross Lake Michigan and replacing the pipeline, using the best available technology and infrastructure. However, the report failed to develop a timeline for completing the independent analyses, leaving the future of the pipeline in limbo. The Department of Environmental Quality (DEQ) and the Attorney General’s office did not respond to Circle of Blue’s inquires about how the state intends to carry out the report’s recommendations. The pipeline task force was convened last year to respond to safety concerns about Line 5. In 2012, the National Wildlife Federation issued a report that brought public attention to the aging Line 5 pipeline and its potential risks, following Enbridge’s plan to increase its daily capacity by 50,000 barrels of oil. 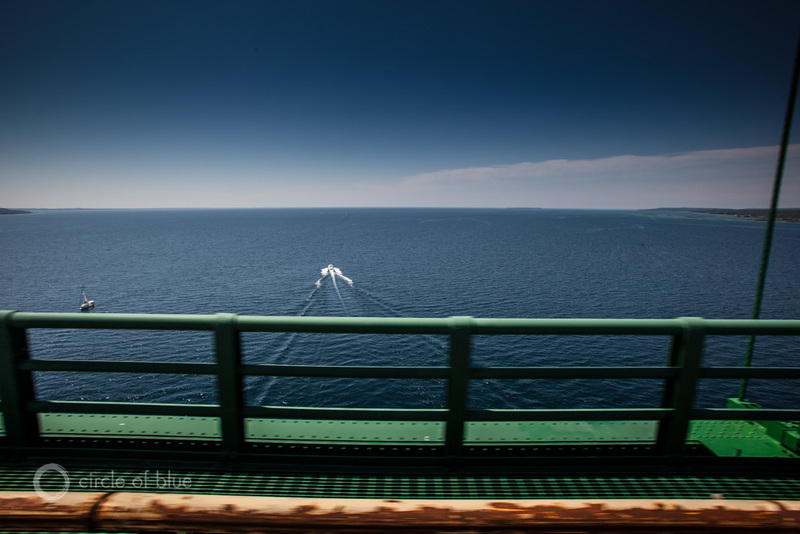 A 2014 report from the University of Michigan called the Straits of Mackinac the “worst possible place for a spill,” because of strong currents that flow between Lake Huron and Lake Michigan. The task force report additionally found an array of weaknesses in the policies that govern state pipelines. The state of Michigan does not have a centralized authority for mapping existing pipelines and coordinating emergency spill responses. Nor does Michigan law require energy companies to submit their spill response plans for review. The task force report recommended that the state consider an executive order creating an advisory committee on pipeline safety, which would be responsible for coordinating with local and federal authorities and ensuring the safe operation of pipelines within state borders. Miranda Cawley is a student at Northwestern University’s Medill School of Journalism and a Traverse City-based intern for Circle of Blue. Reach her by email at mirandacawley@gmail.com, @miranda_cawley on Twitter, or comment below. Great article. Your objectivity and fair treatment of this critical matter is refreshing g and should be an example to which journalists should aspire. As a new follower or Circle, I am e couraged to hear a clear calm voice about my beloved Straits. Many thanks.